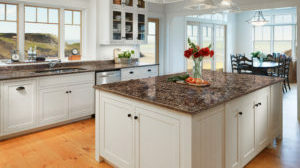 St. Germain's Cabinet Inc. is a full service countertop fabricator of Solid Surface and Laminate Countertops. Our highly skilled and experienced fabricators work with the most state-of-the-art machinery to provide the highest quality countertops for our commercial and residential customers. In addition, St. Germain's provides precise measuring and installation of all countertops purchased through our dealer network including Quartz, Solid Surface, Laminate, and many others. Please see our full list of product offerings below to see what type of material would best suit your project. 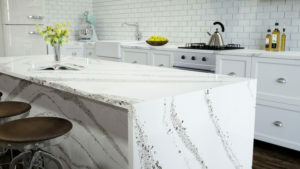 Quartz countertops are made from 93% pure quartz that make it both elegant and extremely durable. 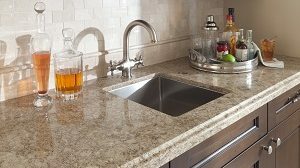 Quartz is an excellent choice for those looking for a maintenance free countertop since they're non-porous and stain resistant. 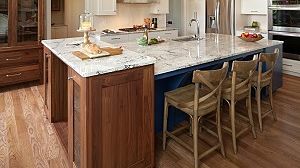 The most widely known quartz counter-top company in the industry is Cambria®; it's a family owned Minnesota based company that is the only quartz countertop that is made in America. 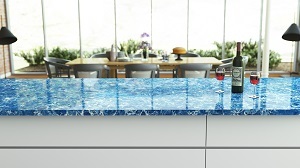 Visit our list below to see all our quartz counter-top offerings. Solid surface is a man-made material that was originally introduced in 1967 by DuPont under the name Corian®. Solid surface countertops are easy to clean because they're non-porous; this makes them an excellent choice for both residential and commercial settings such as medical facilities. Solid Surface is one of the only repairable countertops in the market so it's an excellent choice for those who are hard on their countertops. Please see the information below for Solid Surface Countertops that are offered through St. Germains. 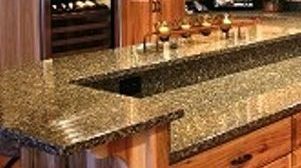 Laminate Countertops are manufactured from layers of decorative craft paper that is sandwiched between clear plastic layers under heat and pressure. This plastic surface protects the decorative paper from moisture and abrasion. These sheets are then bonded to a particleboard substrate for countertop applications. Laminates are one of the most affordable countertop materials available and offer a full range of style options. Please see our list below of some of the brands we work with.